A 6-year-old Texas boy was killed just days before Christmas when sheriff's deputies opened fire on a woman they had been chasing — and one of the bullets pierced the wall of a mobile home and struck the child in the abdomen. 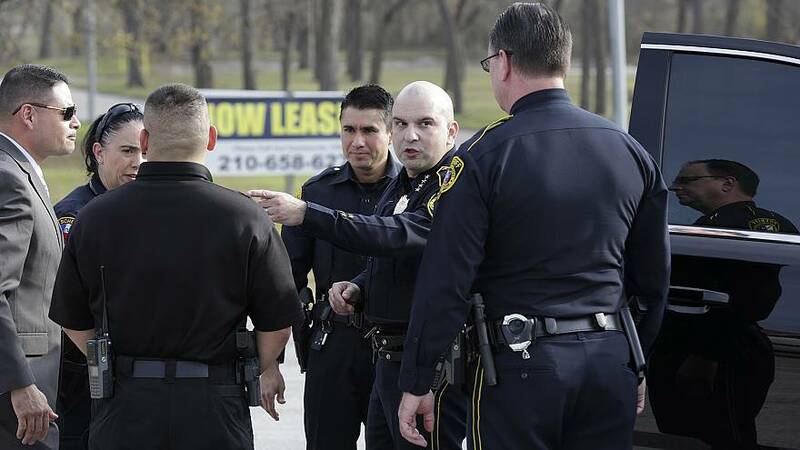 The woman, a suspected car thief who had been trying to break into the home, was also killed in the shooting on Thursday in Schertz, a small town some 20 miles northeast of San Antonio, NBC affiliate WOAI reported. She was later identified as Amanda Lee Jones, 30. "Right now, what I'm dealing with is, is a tragic accident," Bexar County Sheriff Javier Salazar said at a news conference Friday, although he added the shooting is still under investigation and other authorities like the district attorney's office would make a final determination. "In my opinion, it's a tragic accident that led to the death of this young man," he said. The boy, Kameron Prescott, was fatally shot as deputies chased Jones in a "prolonged pursuit" that was reported as a call of a stolen vehicle which involved a known suspect who had outstanding felony warrants, Salazar said. During the first encounter, a deputy "identified what he believed was a weapon in the hands of that suspect" and the woman later threatened deputies with a weapon "and verbalized to him that she intended to shoot him with that weapon" — although no gun has yet been found, Salazar said. Salazar said investigators had found what appeared to be a pipe that had the suspect's blood on it underneath the deck where the shooting took place. Salazar said Jones got "cornered" at the home in the Pecan Grove mobile home park and threatened Kameron's family as well as officers when they caught up with her. "Kameron was the kindest-hearted little boy that I have ever had the pleasure of teaching," the boy's first-grade teacher, Shanda Ince, said in a statement released by the Schertz-Cibolo-Universal City Independent School District. The slain boy and his family — which includes a law enforcement officer — do not know the suspect, Salazar said. "The grandfather of this young man, Kameron's grandfather, is a friend of mine for the past 20 years," Salazar said. "He's a peace officer. I've actually spoken to him and conveyed messages to the family through him." According to the Bexar County Sheriff's Office, the boy is the grandson of Steve Prescott, an officer with the San Antonio Police Department. "We can certainly understand the media's interest in Kameron's case, but we are asking for privacy for the entire family and for any SAPD Personnel helping us deal with this already difficult situation," Prescott said in a statement on Saturday. Four deputies fired at the woman, Salazar said. They were later identified as deputies John Aguillon, George Herrera and Jesse Arias, and Reserve Deputy Johnny Longoria. Their experience ranges from two years to 27 years on the job and all were shaken by the incident, he added. The deputies involved have been placed on five days of administrative leave, the sheriff's office said. Salazar said that civilian witnesses as well as the deputies said Jones had threatened to shoot them and indicated that she had a gun. "At the time, we don't believe she was armed. She was presenting to be armed at various times throughout this prolonged pursuit," Salazar said earlier. Salazar said that his office was still searching the area for a gun and was using a helicopter and dive team in the search. "That deputy is still adamant that what he saw was a handgun," Salazar said. Salazar said there was good audio of the incident, but said his office did not have clear video of the shooting. A helicopter overhead caught the scene moments after, and the deputy who had a body camera unintentionally obstructed its view when he raised and fired his rifle. Salazar said internal affairs is investigating the matter, but said "preliminarily ... it appears as if policies were complied with." As of Friday evening, it was unclear when the sheriff's office would release the video, which Salazar said included video of officers administering first aid to the six-year-old boy. The deadly drama began around 11 a.m., Salazar said, when a deputy responding to reports of a stolen car found Jones hiding in a closet and she allegedly told them, "I have a weapon, I'm gonna shoot you." Somehow, the woman was able to flee the residence into some nearby woods where the deputy lost her and called for backup, Salazar said. Jones was later spotted fording a river and the deputies chased after her in "water that was up to their chin." Salazar said the deputies believed Jones was armed because she appeared to point a weapon at them during the foot chase. Two relatives were in the mobile home with little Kameron when the fatal shots were fired, Salazar said. Neither was hurt.